Last Day To Subscribe To Godrej Agrovet IPO. Should You Invest? Godrej Agrovet IPO consists of offer for sale of Rs 866 crore and a fresh issue of Rs 292 crore. Godrej Agrovet IPO: Domestic brokerage Angel Broking has a 'subscribe' rating. Agri-business player Godrej Agrovet, a subsidiary of Godrej Industries, which had launched an Rs 1,150 crore initial public offer (IPO) has been subscribed 2.33 times by the end of day 2. The IPO, which is a mix of fresh issue and an offer for sale by existing investors, will give the company a valuation of Rs 8,800 crore at the upper end of price band, which is Rs 450-460. The IPO will be open for 3 days through Friday (October 6) and can be subscribed in lot sizes of 32 shares. In the pre-IPO placement, Godrej Agrovet has already raised Rs 8.5 crore by issuing 192,901 shares at Rs 440/share. The company on Tuesday raised Rs 341 crore by issuing shares to anchor investors at Rs 460 a piece. The IPO was subscribed 2.33 times as of the end of the second day of the issue. 1) Godrej Agrovet IPO consists of offer for sale of Rs 866 crore and a fresh issue of Rs 292 crore. Through this issue, Temasek Holdings is selling 7.1 per cent stake in the company. Post this issue Temasek Holdings's shareholding in the company will come down to 12.9 per cent from 20 per cent earlier while Godrej Industries' stake will fall to 68.8 per cent from 74.8 per cent. 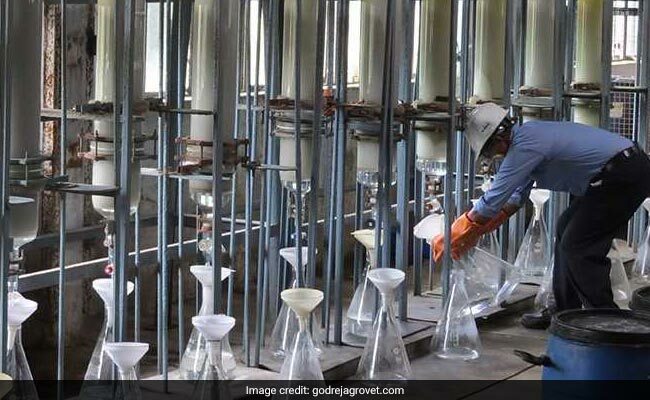 Out of the fresh issue of Rs 292 crore, Godrej Agrovet plans to use Rs 100 crore for repayment of working capital loans, Rs 150 crore for repayment of commercial papers and the rest for general corporate purposes. 2) Incorporated in 1991, Godrej Agrovet is a diversified, R&D focused, agri-business player with operations spread across five business verticals - animal feed, crop protection, oil palm, dairy and poultry and processed foods. It is also the largest crude palm producer in India and 4th largest animal feed producer in Bangladesh through its 50:50 joint venture ACI Godrej. 3) In FY2017, the company derived 53 per cent of its revenue from animal feed business, 10 per cent from palm oil, 16 per cent from crop protection while 21 per cent from dairy business. As per Crisil Research, the animal feed industry, which was valued around Rs 72,500 crore in FY2017, may grow at a CAGR of 13-14 per cent to over Rs 1 lakh crore by FY20. 4) Godrej Agrovet has reported a net profit of Rs 274 crore on revenues of Rs 4,911 crore in FY2017. Its revenue and net profit have grown at a CAGR of 15.5 per cent and 27 per cent respectively over last 5 years. The company has consistently reported more than 30 per cent return on equity between FY14-16. In FY17 the company reported a ROE of 27 per cent. 5) At the upper end of the IPO price band of Rs 450-460, Godrej Agrovet shares are valued at 33.5 times its FY17 adjusted earnings per share, according to Angel Broking. The brokerage has a 'subscribe' rating on the issue. "At 33.5x, GAVL does not appear expensive ... We assign a subscribe rating to this IPO considering its diversified business profile, decent margins, strong return ratios, healthy balance sheet and strong history of its parent," the brokerage said. Domestic brokerage IIFL also has a "subscribe" rating on the issue. Higher competition, lower profitability of crop protection and palm oil business are key downside risks in the business of Godrej Agrovet, analysts say.